Ramblings from an Over-Squozen Brain: Equipment Purchasing Day! Our second day in Cagayan de Oro began with the opportunity to chat via Instant Message with a couple of loved ones at home ... in fact, I got to watch a little of our Wednesday night service live via the Christian Challenge webpage. It was wonderful to get to hear some of the worship and a little of David Stellwagon's message. The Internet has totally changed our lives in so many ways that we probably take them for granted. 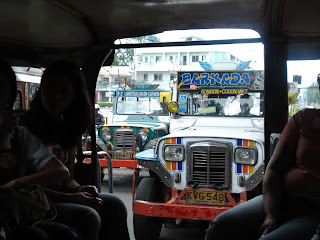 Then it was back in another Jeepney to head to a mall where Bro. Elmerson had already scoped out some of the equipment. We used Jeepneys to transport ourselves all day long. It cost about 10 cents per person to ride as long as you figure out which one to get on. They run routes around town and you get get just about anywhere fairly cheaply. (In this picture you can really see the Jeep influence on the front. I was told the name Jeepney is a combination of "Jeep" and "Nissan". Another theory is the "ney" comes from "knee" since people sit knee to knee in the back, facing each other. Unfortunately the store we visited didn't have the projector we needed but we were able to purchase some amplified speakers and DVD players. So it was off to another mall, then another mall, then some other stores, then back to the original mall to pick up the speakers and DVD players. We were able to purchase one projector but we're still looking for two more. There are several stores that have projectors but a very important feature to us is the projector must have a cleanable filter. So many of our films are shown outdoors that we need to protect the equipment as much as possible. I took several pictures of different things that you might enjoy. You can see the pictures I took at: http://www.flickr.com/photos/nathanmartin/. You may want to view them as a slide show. I just have to share one more piture here, though. 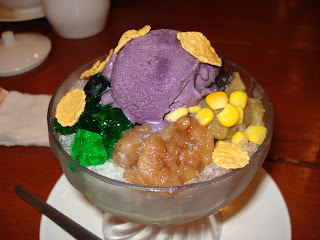 We ate lunch at a Japanese tea room in one of the malls and after lunch we ordered a common dessert called "Halo Halo" which means "mix mix". It's a mixture of purple-colored vanilla ice cream, red and green jello, yellow corn and some brown root along with something else I don't remember, all on a bed of crushed ice and sprinkled with corn flakes. I didn't order one but Patrick did. He only ate the ice cream! (You can see the picture of Patrick and the dessert on my Flickr site. We finished up our shopping by buying sturdy plastic suitcases for each man to carry and store the equipment in (lined with foam) and headed back to the hotel. We had to take two taxis this time because we had so much equipment. We still need two more projectors so Bro. Elmer is out scouting some stores as I type this. We'll finalize the purchases tomorrow and do equipment training as well. Then Saturday we head back to Manila to catch our flight to Hong Kong, then to Kathmandu, Nepal. Well, that about wraps it up for today. We're all pretty tired so we'll be getting to bed fairly early. (I was up entirely too late last night!) I wish I could say we've adjusted to the time zone difference but you just don't adjust to a complete swapping of day and night very easily. But we're coping and God is giving us strength. Thank you for your prayers, comments, emails and support. We are very encouraged. Talk to you tomorrow! We have been enjoying the trip with you both. This is so neat to see what you're doing as you're doing it! I've printed out each blog entry (with pictures) and I'm going to keep the Missionary board at church posted with them. The first ones were on the board last night. That way everyone can see what's going on. 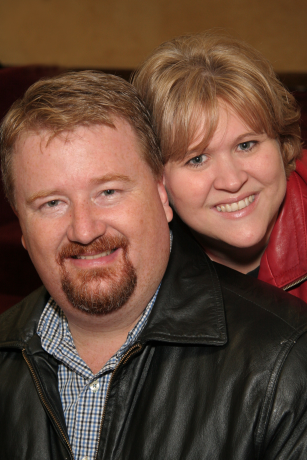 We love you and Patrick and are keeping you both lifted up in prayer. (Lori & the girls and Monica & the kids too!!) God is truly an AWESOME GOD!!! You would not believe how those pictures make me want to head for the Philippines. Doesn't seem possible that its been 47 years since I was stationed there with the Navy. (1960-62) I well remember how friendly the Philippine people were in general. David did an excellent job last evening. It was the kind of message the needed to be heard by the whole world. He dealt with the slavery and power of sin. After services the fireworks began. Everyone had a great time. I visited for a bit just to say 'hi'. Missed you on the 4th. Lori and the girls, Andre and his family were with us. We were to meet Shana and kids for some boating at the lake, but the weather didn't allow that. Anyway, I know everyone is thrilled to read your reports. Your mom and I certainly are. It is like having a ring side seat. The pictures are such an added plus. Thanks for your note. I'm glad you're enjoying the pictures and I appreciate you printing them out so folks who don't have computer access can see how the trip is going. That's a blessing! I can see how easy it would be for you to fall in love with the Philippines. 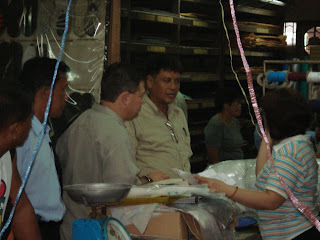 The Filipinos are gracious people, especially here in Cagayan de Oro, which is nicknamed "The City of Golden Friendship". I think of you often as I look around, seeing some of the things you may have seen. I really think you and Mom should make a trip this way. You would definitely enjoy it!! !